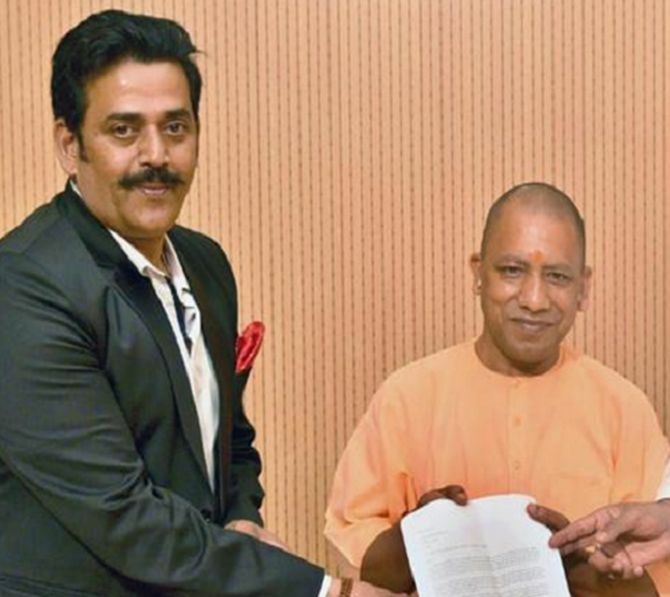 In a surprise move, the Bharatiya Janata Party on Monday announced Bhojpuri film star Ravi Kishan as its Lok Sabha candidate from Gorakhpur, the bastion of Uttar Pradesh Chief Minister Yogi Adityanath, and dropped its Sant Kabir Nagar MP Sharad Tripathi, who had left his party red-faced by beating an MLA with shoes. In its list of seven more candidates, the BJP shifted sitting Gorakhpur MP Praveen Nishad, who had won as the joint Samajwadi Party-Bahujan Samaj Party candidate in bypoll in 2018 but joined the saffron party recently, to Sant Kabir Nagar and fielded Tripathi's father Ramapati Ram Tripathi from Deoria. However, Nishad joined the BJP earlier this month after the Samajwadi Party turned down his demand to contest as a candidate of Nishad Party, headed by his father Sanjay Nishad. His party had also ended its alliance with the SP-BSP and joined hands with the BJP.